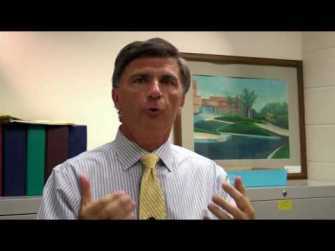 Bob Ehrlich talks about the campaign and why Maryland pols come to sweat in Crisfield heat. 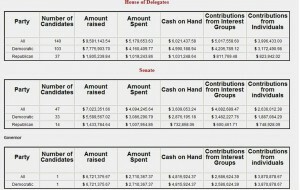 Lynn Beiber from Crofton chimes in about the Governor’s race: more republican backroom dealing ——————————————————————————–Lmb0258@aol.comWed, Jul 14, 2010 at 11:22.. Tune in to State Circle on Maryland Public Television tonight at 7:30 PM. My favorite interlocutor Steve Lebowitz aka Justdafacts,.. Since Martin O’Malley seems to be hellbent on brushing aside the continued MARC train issues to the point that one..
“This election will ultimately be about which candidate puts the interests of Maryland’s working families ahead of the special interests…”.. So the Brian Murphy campaign has been telling anybody who will listen that their guy can beat Martin O’Malley, whereas.. The latest Rasmussen Poll has Governor Ehrlich and Martin O’Malley deadlocked at 45 a piece among likely voters…..but that’s not..
Have you taken a look yet at Governor Ehrlich’s Entrepreneur Agenda? You should, because it’s the first time any statewide.. I think we all know what the headline from this morning’s Washington Post story said about the Governor’s race: O’Malley..
A whopping ten days after announcing that Carmen Amedori would serve as the running mate for Brian Murphy’s quixotic campaign.. Since Red Maryland’s founding in 2007, the writers and editors here have been extremely critical of the direction of policy.. Desperation is setting in early on the second floor…. 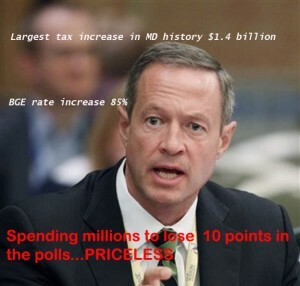 The game of chess between the O’Malley and Ehrlich camps began..
Martin O’Malley: He brings higher energy costs to life. From my latest Examiner.com piece: Ecomagination” is the name General Electric.. In a nice moment of synergy, Center Maryland’s centrist facade meets scare(d) tactics with this morning’s advice that Bob Ehrlich..
We’re starting a new feature here at RedMaryland, where we ask Maryland Republican candidates and leaders ten questions about their..
A brief note on the meaning of last night’s victory from my intellectuallodestar, and why now is no time to.. The left has decided to examine Governor Ehrlich’s chances of unseating Martin O’Malley next year, and Adam Pagnucco decided to..
My RedMaryland colleague Michael Swartz has done some excellent analysis about the likely prospects of Congressional and Legislative reapportionment here..
Larry Hogan Jr., Appointments Secretary for former governor Ehrlich, is setting up an exploratory committee, Hogan for Maryland, to run.. This is just one of those moments where you just have to sit back and shake your head: A state..
How come it only ever seems like Governor O’Malley and his administration are surprised at the need for fiscal restraint,..
Adam Pagnucco has spent this week trying to bury the State Republican Party due to changes in the voter registration..
For a long time I was discussing the likelihood that Comptroller Peter Franchot would challenge Governor O’Malley in next year’s..